Growing up by the sea I love space, endless horizons, being at the edge of the world; but all people need space, elbow room and air to breathe. But this country is compact and not bijou. Its attitude to ‘a country fit for heroes’ has slipped to pile-’em-high and watch-’em-fight-it-out. Buying our first flat in Sussex in the late 80s Thatcher’s Free Market Revolution was up-and-running and going to change our lives forever. It did. It meant if you had bought your home in the 70s you could pay your mortgage and save on an average salary. A house was less than three times that salary. After Thatcher’s Big Bang property prices became an insanity many have enriched themselves on. But at a price that will be paid by our children. This really is a Brave New World. An average salary won’t buy you a house any more; you are at home with parents wondering what the future holds. Your degree will leave you indebted and facing the remote prospect of buying a very modest flat or house that will now be 10 times your salary leaving you with no disposable income. A 40-fold increase in property prices was never sustainable but we watched voyeuristically and unquestioningly. We have let Free Market mantras run riot and we have a neo-con government that is as blue-rinsed about letting the gap between winning and losing widen, as did its predecessors. But, there has never been a Free Market. As Chomsky says, Free Markets are for others. The Free Marketeers are as protectionist, corporatist and as interventionist as the Socialista. The free marketeers won’t build. It doesn’t get more restrictive. Oh, by the way we in the UK owe £1.4tn also! But that aside it is living space that we took for granted and is now the precious need for children to develop their full potential. UK living space is the worst in Europe. We are a small island you say, but only 11% of our land mass is built upon. Successive governments spit in the wind about building programmes. But one way to generate new heat in the economy is to build sustainably (not like the Irish banks!). If we don’t we will face a long slow decline. We will have good waistlines, rosy cheeks but emaciated communities. 3.5m children live below the poverty line in this country and many are in high-rise damp ridden hovels. We may not be able to address the parenting that deprives of emotional bliss but we can knock these shacks down and build decent spaces on green field sites that are better placed for human beings than keeping land-owners’ bank balances secured. 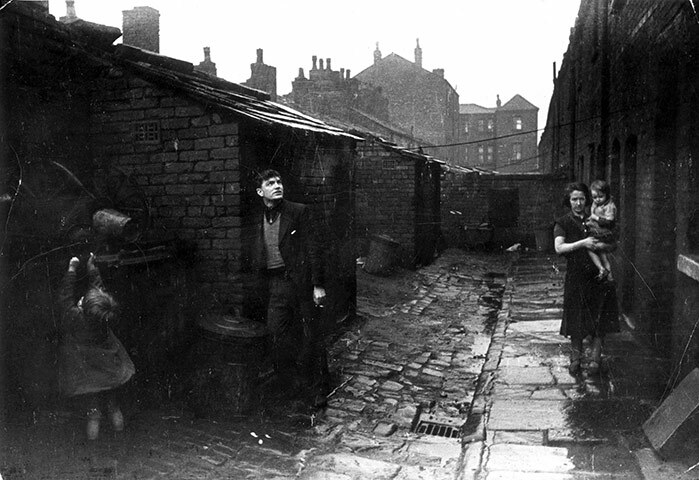 It took two world wars to move the British government to demolish this country’s slum dwellings. What will it take for this current government, a government who are probably the most existentially secure group of individuals in the history of so-called democracy, to recognise the slow car crash of no-home-owning for the indebted generations. Again, the answer is to build, build and build. But that will require not just a change of government but a change belief, values and action.